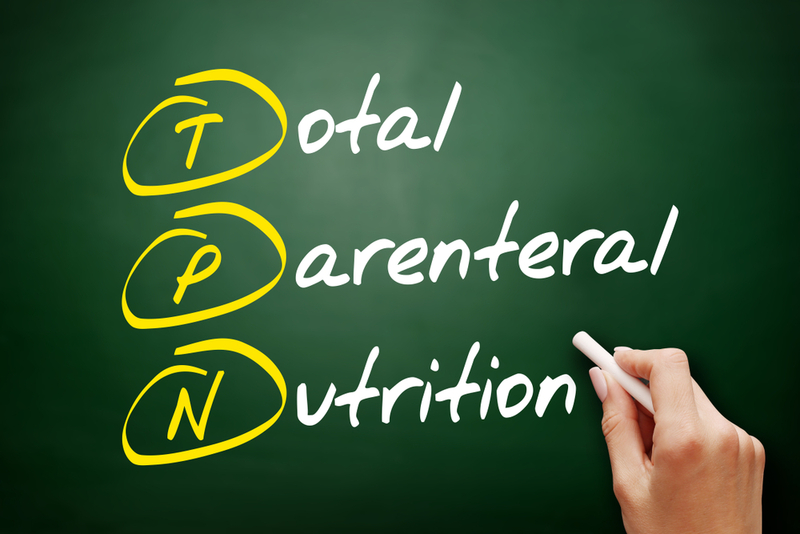 What Is Total Parenteral Nutrition (TPN) and When Is It Needed? Food provides the nutrition you need to grow, develop and sustain life. When you’re healthy, you can eat food through the mouth, which is then chewed, swallowed and digested — supplying your body with the necessary nutrition. But some people can’t take food in orally and nutrients must be supplied intravenously (or through the veins). This is known as parenteral nutrition, often called total parenteral nutrition (TPN). This article explains what total parenteral nutrition is, why it’s necessary in certain circumstances and its potential complications. Total parenteral nutrition supplies all daily nutritional requirements through a vein (intravnously). In contrast, partial parenteral nutrition supplies only part of daily nutritional requirements, supplementing oral intake. Normally, your digestive system breaks down and absorbs nutrients from the food you consume. The nutrients are then carried by the blood to all parts of your body. Total parenteral nutrition bypasses your body’s digestive system and supplies nutrients directly through a tube called a catheter, which is placed within a large vein, usually the vena cava. It’s typically used for a short-time period (less than two weeks) and then removed once a person can eat normally. But it can provide adequate nutrition for as long as needed. People of all ages can receive total parenteral nutrition, from infants to older adults. When Is It Indicated and When Is It Contraindicated? There are several instances where total parenteral nutrition is necessary to provide nutrition that otherwise could not be provided orally. Just as there are several instances where total parenteral nutrition is indicated, there are several where it’s contraindicated. Total parenteral nutrition should not be used in patients if it’s not indicated. Compared with enteral nutrition, it’s more expensive and carries a higher risk of health complication. With any invasive medical procedure comes risks, and total parenteral nutrition is no exception. Infection, occurring around the catheter access point, is the most significant complication of total parenteral nutrition, which can increase risk of disease and death. Other potential complications include blood clots, fluid and electrolyte imbalances, liver dysfunction and problems with blood sugar metabolism. Therefore, to prevent or treat these complications, the interdisciplinary team — consisting of the physician, dietitian, pharmacist and nurse — should carefully manage your total parenteral nutrition. Total parenteral nutrition supplies nutrition intravenously. It’s often the only feasible option for people who have a functioning GI tract, who need bowel rest, or who cannot meet their nutritional needs orally. There are many complications associated with total parental nutrition, but these can be avoided with the ongoing support of the interdisciplinary team who are trained in nutrition support, like registered dietitians. Dakota Dietitians provides skilled food, nutrition and health care services to nursing facilities, hospitals, home care and residential living centers throughout South Dakota and surrounding states. If you’re looking for temporary, permanent or tempt-to-hire dietitian coverage at your facility click here. Or if you’re wanting to know more about our consulting services click here. « Previous Post Pressure Ulcers: Nutrition Guidelines for Treatment and Prevention Next Post » What Are the Responsibilities of the Long-Term Care Dietitian?